Reddit is a wonderful, messy, terrifying, unpredictable, and often misunderstood place. Its users are famously hostile towards marketers, and yet as the 4th most popular website in the US, it presents irresistible opportunities to reach huge, often highly targeted, audiences. Content marketers want to know how to drive traffic with Reddit. The good news: despite it being a notoriously difficult environment to gain traction in, content marketers can certainly find success on the platform. You can create Reddit spikes, if you do it carefully. For Brandwatch it’s a huge source of traffic and one that doesn’t cost us anything. I am Brandwatch’s in-house social data journalist, and I turn data into stories as part of the Brandwatch React project. 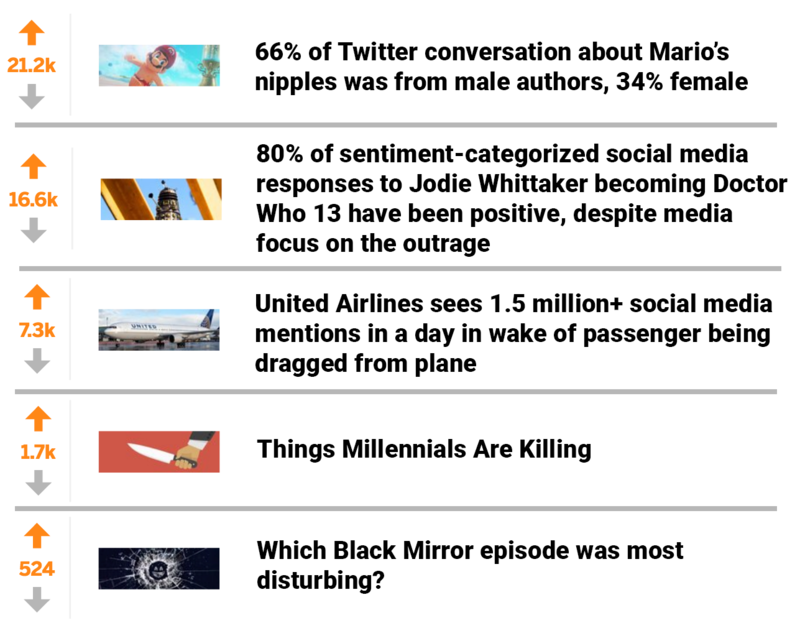 React content deals with pop culture, politics and current affairs, so I spend a lot of my time identifying trending topics, gathering data on them, visualizing the data surrounding them and writing about them on our blog. Since I began at Brandwatch, I’ve diligently kept an active Reddit account where I’ll post about all sorts of things including, where appropriate, links to Brandwatch content. Reddit has been the highest performing source of traffic to our data stories since we started the Brandwatch React project in 2015. Google Analytics tells us where our traffic is coming from, so we know exactly how much is coming from Reddit. Most of the time our Reddit traffic comes from links posted by my own Reddit account, and I tend to include UTM parameters that give an extra indication on Google Analytics that the traffic is coming from a link originally posted by my account. That said, we’ve also had unexpected spikes in Reddit traffic that turned out to be from our readers who had shared our content on the site. With BuzzSumo Reddit engagement data, we now have a more accurate idea of which pieces of content are getting the most interaction. As you can see, Reddit is a significant source of engagement outside of referral traffic to our blog. So, how did we achieve these results, and how can other marketers drive traffic with Reddit and improve their Reddit engagement? Consider this blog post as your guide to drive traffic from Reddit without spending a cent. 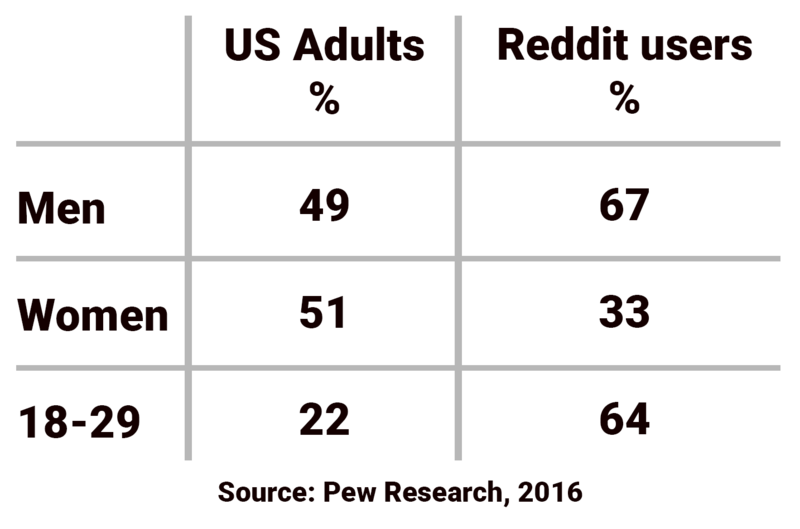 Reddit’s audience skews towards young males, but it’s important to recognise that Reddit itself is made up of thousands of mini communities, known as subreddits, dedicated to all kinds of interests. Each subreddit will have its own demographic makeup, so it would be wrong to write the platform off entirely based on the overall usership figures. Every post starts on a subreddit and, if it is upvoted by the community enough, it could make it onto the front page which is where the the biggest traffic spikes occur. But making it to the front page is difficult and rare occurrence. It requires a carefully curated account that provides value to other redditors. There’s no room for spam – it’s swiftly downvoted into oblivion. A quick tip before we move on – Reddit is lots of different things with content on pretty much everything. I’d recommend turning on the NSFW filters while you’re posting from your desk. Having a “successful” Reddit account takes a lot of work. While generally everyone is free to post wherever they like and no post is more influential than another based on who posted it, each account has “karma” points attached. This is linked to how many people upvote your links and comments and indicates how much others value your contributions. If you’re new to Reddit and immediately start posting links to your own site over and over again, you’ll be called out pretty quickly. That’ll either be from users of a subreddit complaining and downvoting or being “shadowbanned” (which is arguably worse). When you’re shadowbanned, you carry on posting as much as you like and often don’t notice that you’re basically a ghost posting things that no one else can see. [clickToTweet tweet=”pic.twitter.com/pcQcGu31Zn @GLJoyce @BuzzSumo #Reddit #ContentMarketing” quote=”If you’re going to get a steady stream of traffic from Reddit you need to start by thinking about the value you’re adding to the Reddit community.No one wants to see irrelevant, spammy material that wastes their time.”] Instead, make sure that everything you post adds something – whether it’s entertainment or information. Equally, make sure that you’re not only posting links to your own site. Engage with others by commenting on posts (not just your own!) and share links from other sites. It needn’t be laborious – I love spending time on Reddit and contributing to the subreddits that I’m genuinely interested in. A number of my top performing posts aren’t related to Brandwatch at all. I’d say I spend about an hour or two a week on Reddit posting links and comments and won’t necessarily use it every day – it’s definitely less time than I spend working on the @BW_React Twitter account. So you’ve become a good member of the community, adding value to different subreddits and having good conversations with other redditors. How do you construct posts that send you rocketing to the front page? There’s no exact science to it, but I can tell you what’s worked for my own data stories. Firstly, choose a subreddit with subscribers that you think will be interested in the content you’d like to share. I find that when I write content I try to think about where I might post it later and how I’ll present it, and this helps when it comes to promotion time. 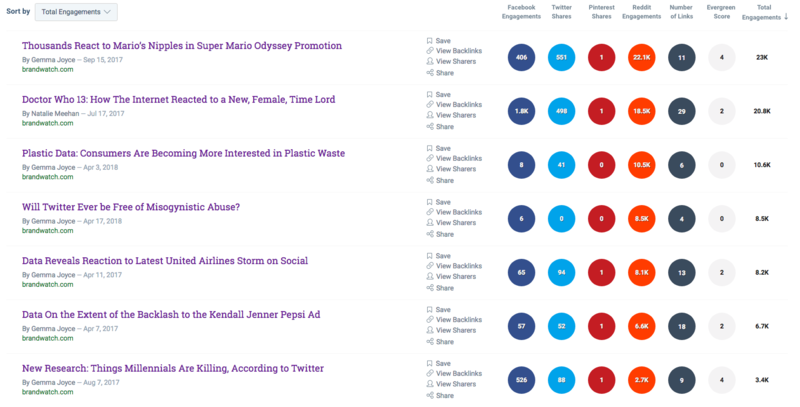 You can use BuzzSumo to find subreddits with high engagement for your topic areas. Enter your topic in most shared, then filter the search to only content from reddit.com. The subreddits will display in the titles after the colon (:). Lucky for me, there’s a thriving subreddit called r/dataisbeautiful which is dedicated to data. Our stories have done well there on on several occasions. This is where I tend to post Brandwatch links (among others, of course). Initially when people see your posts, all they see is a headline. That’s all you’ve got to get someone to click through to your link or picture, so you need to make it count. Regardless of what kind of headline you use, make sure it generates a reaction. Whether it’s funny, harsh, or posing an interesting question, the generation of a feeling or desire to know more is better for clicks than something non-descriptive and, frankly, bland. 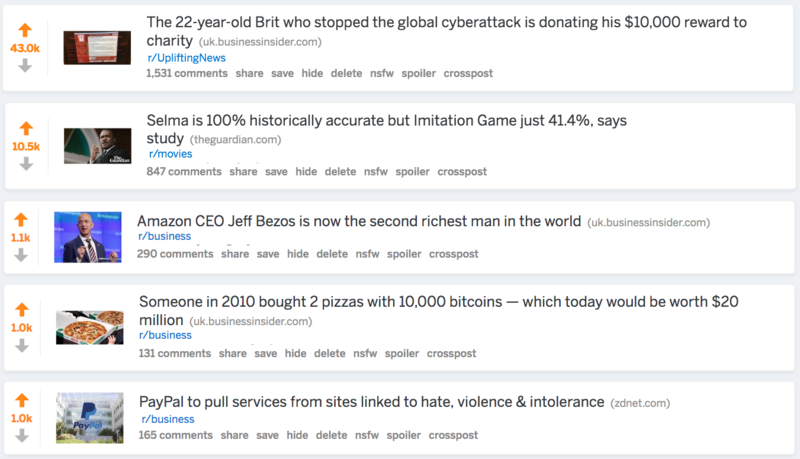 Great headlines that move people toward strong emotion are a key to using Reddit to drive traffic to your content. 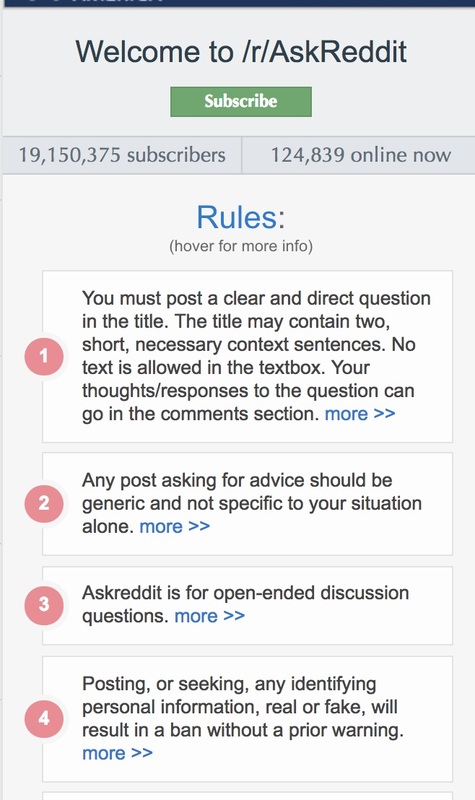 A quick tip for posting on Reddit is to always check the rules of the subreddit you’re posting on. For example, if you post your own content on r/dataisbeautiful you need to add a description of how you gathered the data. If you don’t stick to the rules you won’t last long. Rules are listed on the right side of the subreddit’s front page. I’d encourage anyone who’s thinking of using Reddit to drive traffic to their blog to do some research and go in with the intention of adding to communities, not getting people to click on your stuff. It’s that shift in mindset that makes the difference between people enjoying your content and people immediately rejecting it. Beyond a place to share content, Reddit is also an excellent place to get inspiration for content. Whether it’s analyzing the top-mentioned topics within a certain subreddit that interests you or if it’s finding the questions people ask most on Reddit around a particular topic, there are so many groups and conversations to tap into that the potential for content inspiration is never-ending. Question: You received 200K+ views in 48 hours for the Mario piece, but what is the bounce rate for that post for people who came from Reddit? What is the conversion rate? Are you seeing people who were initially referred to the post from Reddit come back to your Services pages or enter personal information for gated content in the future? The reason I ask is because you received a lot of traffic to the post but there are no comments on it. So it’s hard to tell if people are actually engaged with your content or simply reacting to a catchy headline. Either way, glad this channel is working out for you. I love Reddit and it’s refreshing to see brands like Brandwatch playing nice here instead of spamming the subreddits.